How Are Acids & Bases Harmful? Corrosive substances cause harm to tissues such as skin, eyes, mucous membranes and breathing passages. Acids and bases have corrosive properties. The amount of harm caused by chemical burns from acids and bases depends on the concentration of the substance and the duration of exposure. Any acids or bases may cause damage if they are in concentrated solutions. Strong acids and bases can be corrosive even in dilute concentrations. Acids and bases are corrosive substances. The amount of tissue damage they cause is related to the strength and concentration of the acid or base and the duration of exposure. The acidity or alkalinity of a substance can be determined by its pH value. The pH scale is a measure of the concentration of hydrogen ions in a solution, ranging from 0 to 14. It represents the negative logarithm of the hydrogen concentration in a solution, where a lower pH value corresponds with a higher concentration of hydrogen ions. The pH value is an inverse of the concentration of hydrogen ions in solution, so acids have a lower pH due to the greater concentration of hydrogen atoms, and bases have a higher pH. Acids have a pH of less than 7, and bases have a pH greater than 7. The strength or weakness of acids and bases is determined by their reactivity with water. Strong acids readily give up hydrogen ions (H+) in water, meaning they have a high degree of ionization. Molecule of strong bases easily dissociate in water to donate hydroxide (OH-) ions. The strongest acids and bases dissociate completely in water and have the highest degree of ionization. Weak acids and bases dissociate very little in water and do not give up many ions. Acids with a pH of less than 4 can cause chemical burns. Some common strong acids include hydrochloric, nitric, sulfuric and phosphoric acids. Weak acids such as acetic, citric and carbonic are not corrosive. They can safely be consumed and do not irritate the skin. However, at greater concentrations weak acids can be harmful. 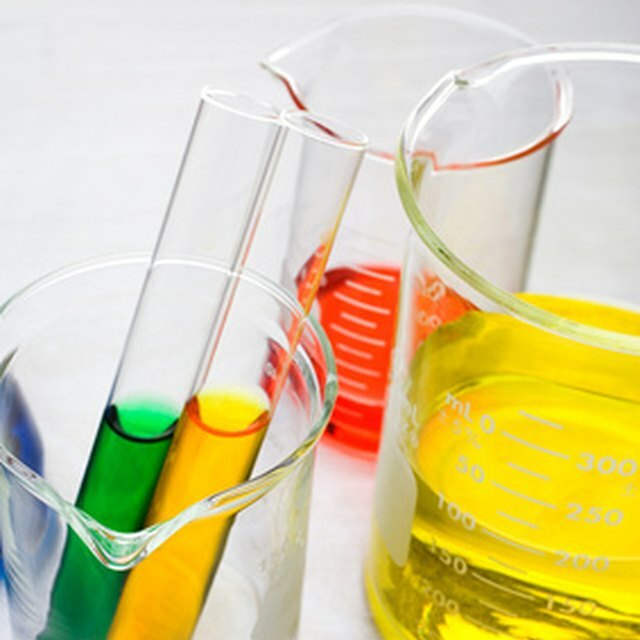 Acids can react violently with water and are harmful in the presence of moisture in the mouth or eyes or in proximity with other aqueous solutions. Vapors from some acids are soluble in water and can cause damage to the eyes, nasal passages, throat and lungs. Burns from acids tend to be felt right away. Immediately feeling irritation or pain allows these types of burns to be treated quickly before extensive damage is done. Bases with a pH greater than 10 can cause chemical burns. Strong bases include, calcium hydroxide, sodium hydroxide and potassium hydroxide. Some common weak bases are ammonia and sodium bicarbonate. Chemical burns from bases do not cause as much pain as acid burns, but the damage can be more extensive. Bases can also react strongly with water, and the reactions of several bases with water are exothermic, meaning they give off heat. Bases also react with oils on skin and fatty tissue, which can lead to extensive damage to skin and subcutaneous tissue. Burns from alkaline substances are also harder to treat than burns caused by acids because exposure is not always detected quickly. Bases feel slippery and can be more difficult to remove from the skin than acids. Corrosive chemicals are harmful to the skin, eyes and respiratory tract. They also cause harm to the digestive system if swallowed. Symptoms of chemical burns on the skin include redness, pain, peeling and blistering. In mucous membranes and breathing passages they cause swelling, inflammation, chest pain and difficulty breathing. Contact with the eyes may cause watering, pain, open sores and blindness. Ingesting corrosives can cause pain and inflammation of internal tissue as well as vomiting and diarrhea. Mentzer, A.P.. "How Are Acids & Bases Harmful?" Sciencing, https://sciencing.com/acids-bases-harmful-6019071.html. 07 May 2018.